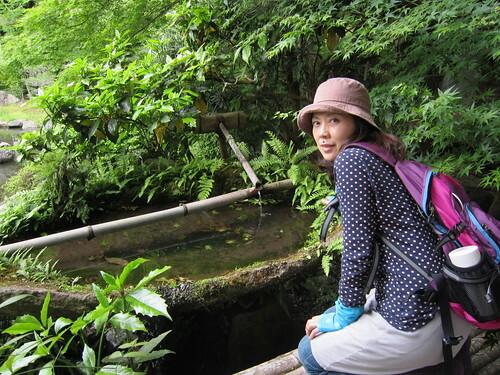 I enjoyed hiking on Higashiyama mountains to Yamashina last weekend. 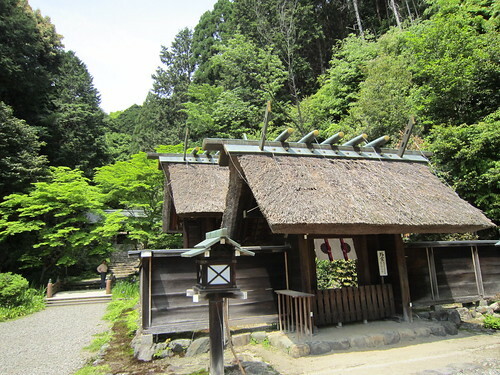 We started from Keage which is the no.32 point of The Kyoto Circuit Trail, and stop by Himukai-daijingu Shrine. 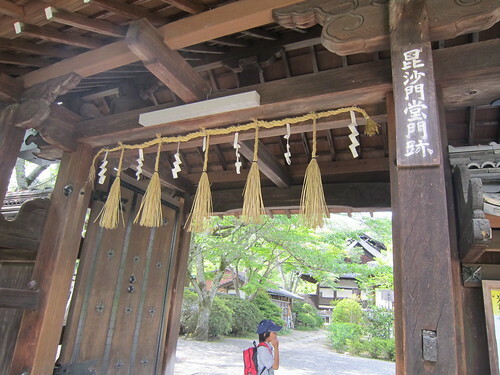 This shrine is worshiped as a small Ise Shrine in Mie Prefecture. Their buildings are rustic, but look so magnificent as well. 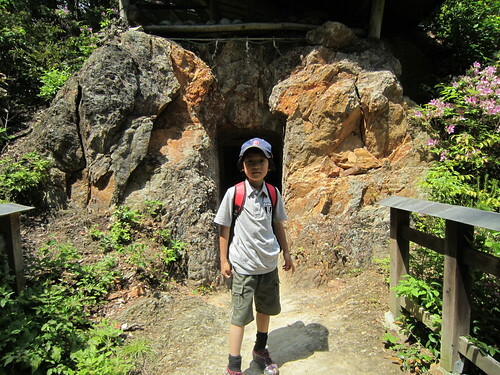 We found a big rock which was called “Ama-no-iwato” next to the main building of shrine. It is said that the God of sunshine retired into this rock and people sang and danced in front of this rock to open his mind. A shinto alter is still decorated into the rock. 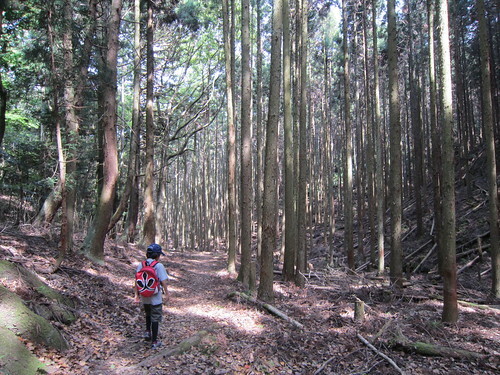 After passing the shrine, we kept going on mountains toward Yamashina. If we turned to another direction at the junction, we could arrive at Mt.Daimonji. To tell the truth, we were annoyed by lots of flies flying around us through the trail. I love spring, but without kinds of flies while I enjoy riding bicycle or hiking. We had arrived at Bishamon-do Temple which was our goal on that day about 2 hours later after starting. This temple moved again and again due to some ancient wars and big fire. Bishamon-do used to be at around Teramachi Street near the Palace in the 11th century. The first moving of temple was by a famous war “Hogen-no-ran” in the 12th century, which was the war with Taira-no-Kiyomori who was the first famous samurai in Japan. 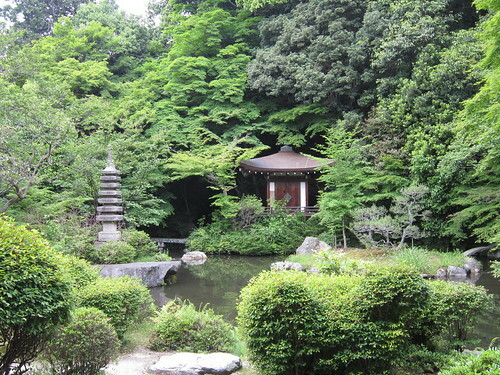 This temple enshrines the God for winning the wars called Bishamon-ten. Samurai used to come to this temple and pray for their win. So some talismans sold in this temple are said to nice for overcoming not only the fight but also something like such as the sport games, some exams, disease etc. And there are some wonderful sliding door paintings drawn in the Edo era in this temple. Some of these paintings were drawn with a unique style of which images in the painting change to another shape when we move while seeing. It was very interesting! I would like to recommend you to follow this route. You can enjoy walking and studying the history. The best way of access to this route, I think, is to park your bicycle at Kyoto International Community House located Keage, start walking on mountains, take subway from Yamashina to Keage after finishing hiking and pick your bicycle at the Community House. Of course you can check some useful messages at the board of Community House before or after the event. Isn’t it a good idea? However be careful! 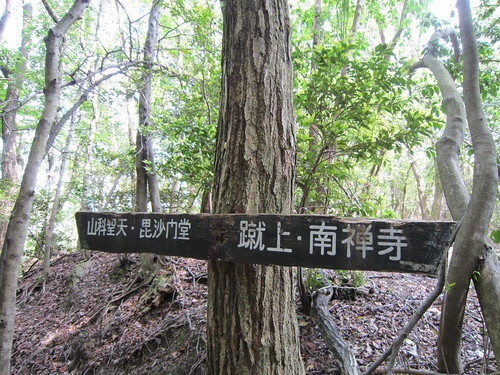 This route on GTK is going to Mt.Daimonji from the junction.